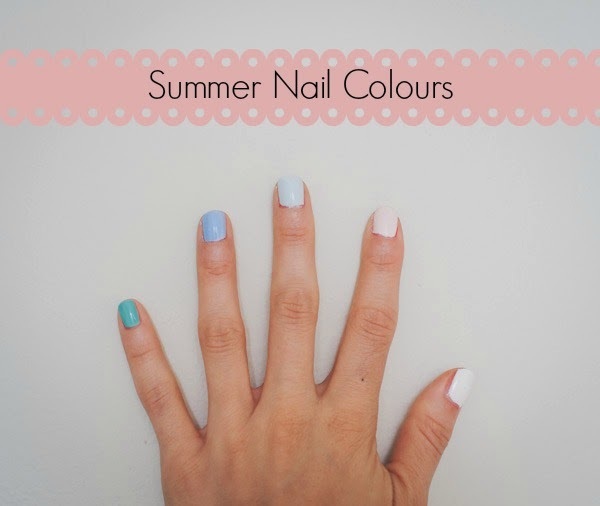 My Favourite Summer Nail Colours - Featuring Essie | La Petite Noob | A Toronto-Based Fashion and Lifestyle Blog. I reach for this green-toned turquoise colour when I'm in the mood for a richly coloured nail. The formula is extremely easy to work with, and I usually only need two coats to achieve a completely opaque nail. If you're like me, and you like to wear gold-toned jewellery, this is definitely the nail colour for you as it compliments all of your baubles perfectly. This shade of electric lavender is definitely eye catching - in fact, it almost looks like it's glowing in certain lights! I tend to lean towards this colour as I ease into summer, since it looks incredible with or without a tan - and as someone who goes into summer as Casper the friendly ghost's stunt double, this is important! I just picked up this nail colour, as it is part of the new Resort 2014 collection. The colour is a beautiful cloud blue - almost a blue toned white. This is a great alternative to the very on-trend white nail, as the blue softens the look a bit and makes the polish very wearable. The formula is a little bit thin and runny, making it the most difficult to work with out of my favourites. I usually apply a coat of white nail polish as a base, and then two coats of Find Me An Oasis, and that seems to work just fine! The reputation of this perfect pale pink nail colour precedes it. Ballet Slippers stays in heavy rotation with me year round due to it's ability to give the nail a very clean, very professional look. This shade is the most work appropriate of all my favourites, and for that reason alone I am on my second bottle of the polish. The formula is very thick so, while it is easy to get an opaque nail, you do need to be careful not to over-apply which leads to chipping. A white nail seems to be everywhere nowadays, and for good reason - a bright white compliments a tan beautifully, and goes well with any summer outfit choice. Essie Blanc, to me, is the perfect white nail colour - it apples beautifully and almost has a tacky constitency making it virtually chip-proof! I use this on it's own, or as a base coat to help achieve a true-to-the-bottle nail colour. Essie Blanc is also my go-to toe nail polish for the summer. What are your favourite nail colours? I would love to know! Lovely shades! Blanc is definitely my favorite one from Essie, but I do love Lilacism and Mint Candy Apple too! I have been eyeing both of those shades recently - I think they may need to join my collection! Thanks for the recommendations.